To calculate the labor cost, multiply the labor hourly wages by the number of labor total hours used to producing single unit. For example, if labor dedicated to producing single unit and takes two hours to complete it. The labor cost is $30 (labor wage $15 multiplied by 2 hours). 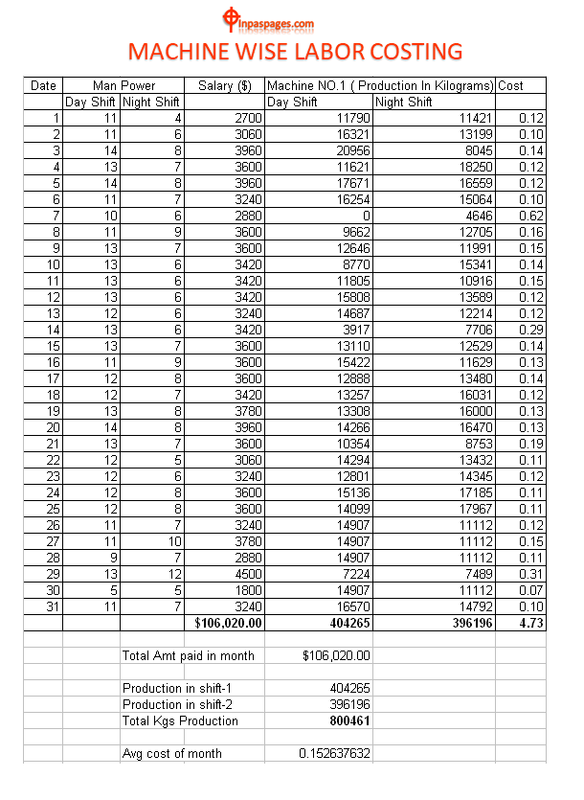 How to calculate Labor cost machine wise? Now days, cost accounting is being necessary part of the business to run smoothly. We all know that the major part of the expenditure is “labor cost” in any industry. The best solution is direct labor costing, but i believe that there are something missing what?. Normally, when we calculate direct labor cost, it will never been effective solutions and its impact will be zero at end of the day. Hence, you have to involve “machine wise labor cost” to effectively calculate direct labor cost. Why machine wise labor cost? We calculate costing labor cost as per overall labors, which is not complete method to get real result there Must Lake of major factor viz… All labors working efficiency, behavior of workmen, nature of works and workers management etc… can be major role in utilization. We have to thing little different then others to achieve real result. Different think that means not out of track its means that we have to go on real data with its analysis to concern partly labor cost on salary base. What is benefit to calculate machine wise labor cost? Machine wise labor costing show the utilization of machine with workmen. If have same two or more machine that we can analysis of each machine utilization. And get result which machine is really work great, behind this theme we all get better understand of operators & other workmen are how handle the work?. Further, if machines having same capacity and nature in single unit. We have to identify & get help in root cause if any trouble happen during operations. More over data of analysis always help in which shift workmen perform better. Here, just show only machine wise labor costing per day to identify & count cost/day & month on base of salary. Labor cost is another major element of the total cost management for any organization. It is necessary to proper accounting and control in time frame to eliminate extending cost fragment & financial risks. For every business labor cost is complicated and complexes to controls over labor cost due to human element in labor makes difficult control. Generally, two types of labor system are in any industry segment. That are direct and indirect labor. Direct labor is that labor which is directly engaged in the manufacturing of product or services. Which can be suitably apportioned to the job, process and commodity part. Second is indirect labor which is not directly engaged in the manufacturing of product / services. But which is indirectly serve in manufacturing processes. Generally they are mechanics, sweepers, mechanics etc. Cost Accounting, Human resources / Personnel, payroll. Manufacturing & engineering, Time & motion study. Generally, Supervisors & department head are accountable for accomplishment of internal strategies, staffing, discharge, categorizing of each employee. The concern authority of department should be submitting some reports to top management such as labor turnover, productivity, incident / accident, disciplinary action, idle time and overtime etc. To be the most important utility of personnel department to analyze the information for calculation of labor cost. In the human resources department, time management and recording of time of each workman involved with organization works. That the recording of time is for two purposes are conducted where time keeping and booking. Time keeping is concerned with the recording of time of workers for the purposes of attendance. Wage calculations whereas time booking is the reporting of each workman’s time. For each department, operation and job for the purposes of cost analyses and job for the purposes of cost analysis. In the engineering / manufacturing department should sustain control over the operational conditions. Production method for each production process. Department by execution some tasks to preparations of strategies and specifications for each work timetable for production. Inspection of jobs at success periods of production to make sure that works are being done according to proposal. Inspection of works after they are completed to insure they are reasonably completed. Best of luck! This is the first step to achieve goal.